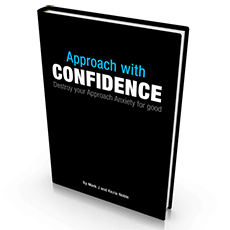 “Approach with Confidence” by Kezia Noble and Mark J is designed to help you overcome approach anxiety when approaching women. It is for those who lack the confidence to approach women and need to develop the confidence to do so. It is intended to help you overcome your excuses and approach the women you truly desire instead of settling for less. This ebook includes exercises to destroy approach anxiety, as well as advice and solutions to the questions and dilemmas preventing you from succeeding with women.